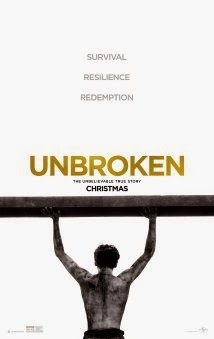 Unbroken (2014), PG-13, 137 minutes - Unbroken is one of a slew of biopics that hit theaters this winter. Directed by Angelina Jolie and starring Jack O'Connell, it tells the story of Olympian Louis Zamperini and his fight for survival after a plane crash led to his incarceration in a Japanese prisoner of war camp in World War II. Zamperini (O'Connell) started out as a mischievous youngster, running around doing pretty much whatever he wanted but at the same time not fitting in with the other kids because of his poor English. As he reached high school, his older brother Pete pushed him to join the track team and instilled Louis with strict discipline during their training runs. The work ethic and discipline paid off as Louis made the U.S. Olympic team and competed in the 1936 games in Berlin, Germany. He would finish eighth in the 5000 meter event, but set a world record with a 56 second final lap. Zamperini enlisted in the United States Army Air Corps in 1941 and became a bombardier during the war. Sent out on a search mission for a lost air craft, he and two other crew members (Russell Alan "Phil" Phillips and Francis "Mac" McNamara) survived a crash devastating crash caused by mechanical difficulties. The three survived in the open ocean for thirty three days before Mac (Finn Wittrock) passed away. Louis and Phil (Domhnall Gleeson) lasted another fourteen days before being found by the Japanese Navy. As if Zamperini's story wasn't extraordinary enough, that was just part of his war time nightmare. He was placed in three different Japanese prisoner of war camps until the end of the war, at two of which he was unfortunate enough to have drawn the ire of prison guard Mutsuhiro "Bird" Watanabe (Takamasa Ishihara), who would eventually be one of General Douglas MacArthur's forty most wanted war criminals. O'Connell does a very good job of portraying Louis Zamperini's strength, perseverance, and leadership. Ishihara is also strong in bringing Watanbe to life. Not just in his general ruthlessness, but specifically when it comes to his enjoyment of singling Zamperini out. Garrett Hedlund (Fitzgerald) and Jai Courtney (Cup) round out the other most recognizable members of the cast. Unbroken may be just one of many biopics making the rounds in theaters right now, but it is definitely worth the time (it runs a little over two hours). It is an inspirational look into the life of an amazing man who lived to the ripe old age of ninety seven years (he passed away in July of 2014).